A team of security researchers—which majorly focuses on finding clever ways to get into air-gapped computers by exploiting little-noticed emissions of a computer's components like light, sound and heat—have published another research showcasing that they can steal data not only from an air gap computer but also from a computer inside a Faraday cage. However, Cybersecurity Research Center at Israel's Ben Gurion University, directed by 38-year-old Mordechai Guri, has developed two techniques that helped them exfiltrate data from computers placed inside a Faraday cage. 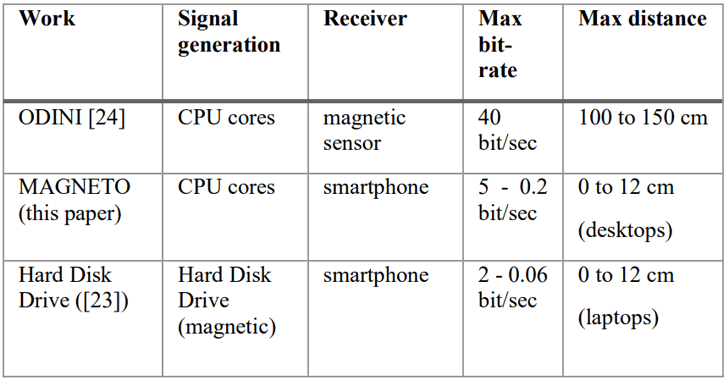 Dubbed MAGNETO [pdf] and ODINI [pdf], both the techniques make use of proof-of-concept (PoC) malware installed on an air-gapped computer inside the Faraday cage to control the "magnetic fields emanating from the computer by regulating workloads on the CPU cores" and use it to transmit data stealthily. "Everyone was talking about breaking the air gap to get in, but no one was talking about getting the information out," Guri says. "That opened the gate to all this research, to break the paradigm that there's a hermetic seal around air-gapped networks." The PoC malware developed by the team then electrically generates a pattern of magnetic field frequencies by regulating CPU's workload, which can be achieved by overloading the CPU with calculations that increase power consumption and generate a stronger magnetic field. The process involves translating data first into binary, i.e. 0 and 1, and the transmitting it into morse-code-like patterns in accordance with electromagnetic emission. "The transmitting program leaves only a small footprint in the memory, making its presence easier to hide from AVs. At the OS level, the transmitting program requires no special or elevated privileges (e.g., root or admin), and hence can be initiated from an ordinary userspace process," the paper reads. "The transmitting code mainly consists of basic CPU operations such as busy loops, which do not expose malicious behaviors, making it highly evasive from automated analysis tools." 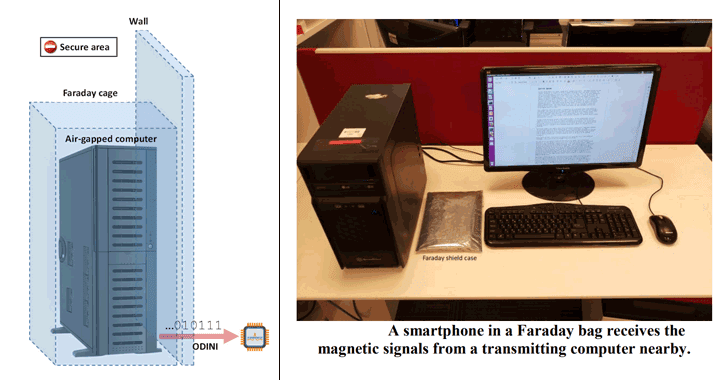 MAGNETO is a short-distance attack where an Android app installed on the attacker's smartphone can receive stolen data with the help of phone's magnetometer— a magnetic sensor that can transmit data even if the smartphone is placed inside a Faraday bag or is set to airplane mode. Researchers suggest three different approaches that can be used to prevent attackers from establishing a covert magnetic channel, i.e., shielding, jamming, and zoning. aIR-Jumper attack that steals sensitive information from air-gapped computers with the help of infrared-equipped CCTV cameras that are used for night vision.